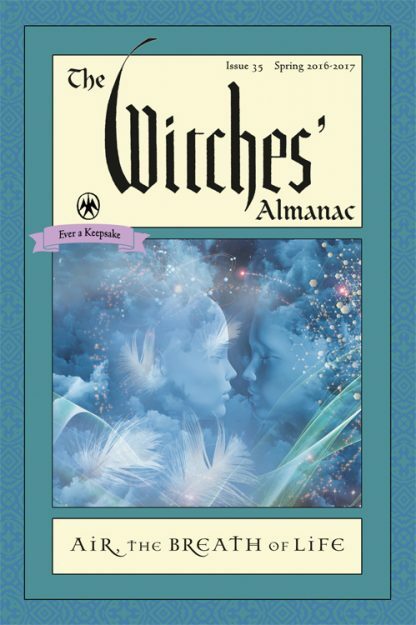 Founded in 1971, The Witches� Almanac is a witty, literate, and sophisticated publication that appeals to general readers as well as hard-core Wiccans. At one level, it is a pop reference that will fascinate anyone interested in folklore, mythology, and culture, but at another, it is the most sophisticated and wide-ranging annual guide available today for the mystic enthusiast. Modeled after the Old Farmers� Almanac, it includes information related to the annual moon calendar (weather forecasts and horoscopes), as well as legends, rituals, herbal secrets, mystic incantations, interviews, and many a curious tale of good and evil. Although it is an annual publication with about 15 percent of the content specific to the date range of each issue, there are pages and pages of interesting and timeless articles about Witchcraft/Wicca, magic, herbalism, charms, spells, and related topics. The theme of Issue 35 (Spring 2016 � Spring 2017) is air: the breath of life. Also included are articles on Lithuanian Day of the Dead, Nine Elements of the Druids, Tomb Sweeping Day, Kohl, and the Akashic Records.